The Netherlands Electron Microscopy Infrastructure (NEMI) is the central access point for electron microscopy in The Netherlands. NEMI officially started on February 1, 2019. NEWS: 17 million euro for NEMI ! We are very excited that on April 12, 2018, the NWO National Roadmap for Large-Scale Scientific Infrastructure awarded 17 million euro to NEMI. The official press release from NWO can be found here. In the image below, chairman Prof. Judith Klumperman receives the granting certificate from the Dutch Minister for Education, Culture and Science, Ingrid van Engelshoven. That electron microscopy is booming, is also exemplified by last year’s Nobel Prize in Chemistry 2017 for cryo-EM, with laureates Jacques Dubochet, Joachim Frank, and Richard Henderson (https://www.nobelprize.org/nobel_prizes/chemistry/laureates/2017/). 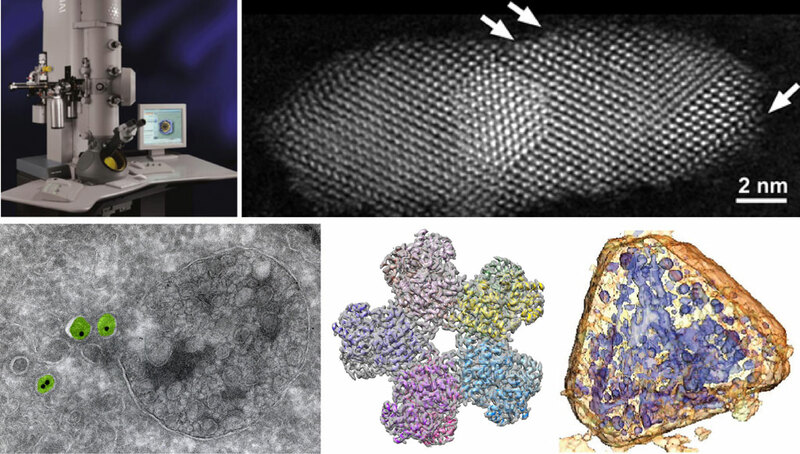 Recent technological innovations have led to a revolution in electron microscopy (EM), which has greatly increased the demand for high-end EM in in both Life Sciences and Materials Sciences. NEMI is the Dutch national infrastructure for EM and has the aim of coordinating EM infrastructure, innovation and access at the national level. NEMI will keep the Netherlands at the forefront of innovations in EM and empower EM applications for top-level research. The infrastructure is distributed, with multiple specialized nodes focusing on particular methodologies and expertise. The Dutch research community will benefit from NEMI by sharing cross-disciplinary expertise, state-of-the-art equipment, and by coordinating funding opportunities. To promote findability, easy access, interoperability and reuse (FAIR principles) of EM data. EM has enabled numerous scientific discoveries and industrial innovations in a range of disciplines, most notably the life and materials science. In the area of the life sciences, EM enables the in-depth understanding of the basic concept of life. EM is indispensable to address biological structures both at cellular and molecular scales. It has revealed how each cell of the human body is divided into membrane compartments with specialized functions that together organize a diversity of processes, such as protein synthesis, energy production, and distribution of genetic material. Recent developments in EM at extremely low temperatures even allow scientists to zoom in to atomic resolution and see individual proteins or protein complexes within the native environment of the cell. This provides critical insights in the molecular processes of diseases (e.g. transformation of cancer cells, disease-causing mechanisms in the ageing brain) and human development (e.g. differentiation and renewal of stem cells). Life Sciences EM. Left and middle panel: Artist impressions highlighting that EM has led to understanding the basic concept of life by revealing processes at the cellular (left) and molecular (centre) level. Individual proteins within the native environment of the cell can be imaged by EM. Right panel: EM image color coding distinct compartments in the cell. Indeed, molecular and cellular defects underlie most diseases, and EM uniquely provides the resolution to study localization and structure of molecules such as proteins, together with the crucial structural information. EM applications are found in fundamental biological research, including infectiology (e.g., EM studies to understand how HIV infects a living mammalian cell), neurobiology (identification of specific regions within the brain, followed by nanoscopic investigation with EM) and pathology (studying subtle pathologic phenotypes that are too small for light microscopy). Recent innovations in automated imaging in 2D (x,y axes; large-scale EM) and 3D (x,y,z axes; volume-EM) are creating unprecedented possibilities to reveal the architecture of cells within the context of their complex environment, such as tumors and even entire brains. On the molecular level, until recently, only X-ray crystallography and NMR spectroscopy were able to deliver the resolution necessary to describe the structure and understand the biological function of macromolecules at an atomic level. The limitation of crystallography, however, is that only systems that can be obtained at high yields and crystallized are accessible for this technique. The advent of a new generation of EMs, where samples are studied at cryogenic temperatures (cryo-EM), has revolutionized this field. Cryo-EM, selected the ‘method of the year 2015’ by Nature Methods, allows structural studies of biological systems without the need for crystallization. Not only has academic research been revolutionized by this, pharmaceutical and biotech industry have also embraced this emerging technology. For example, Genentech, Novartis, Pfizer and other companies have invested in their own top-end cryo-EM facilities. Cryo-EM opens a whole new avenue of biological research. Moreover, it covers a key resolution and spatial range window, that allows (bio)chemistry-driven research on molecular structure and biology-driven research on cellular structure to be bridged. For example, an atomic model of HIV-1 capsid-SP1 elucidated by cryo-EM reveals structures regulating assembly and maturation. These revolutions in the EM field have created worldwide excitement for EM, which is reflected in the numerous high-impact studies published in prestigious journals (e.g., over 200 papers in Nature, Cell and Science in the past 3 years). In the area of the materials science, EM is the only technique available that can image the atomic structure of materials with (sub) nanometer resolution. Using analytical tools, also the chemical composition and electronic properties can also be mapped in 2D or in 3D at the nanometer scale. These detailed characterizations are of major importance to research fields such as the geosciences, metallurgy, catalysis and semiconductors (hard matter), to polymeric materials, materials for tissue regeneration and foods (soft matter) and materials based on colloids (where soft and hard matter meet). EM for materials science. Nanomaterials are nowadays abundantly used in displays, batteries, and solar cells, and as catalysts for efficient conversion of energy resources. Characterization and development of these nanostructured materials requires imaging at the level of individual atoms, which can be achieved with the newest generation of aberration-corrected electron microscopes. EM is also essential for the rapid current developments in nanoscience and nanotechnology. As nanoparticles are key to the development of photovoltaic applications (solar cells, display technology) and for the conversion of sustainable feedstocks such as biomass to chemicals and transportation fuels, EM is an essential tool in sustainability research. TEMs are applied in current electronics research, resolving crucial details about single-atom defects that affect the functionality of the electronic devices. Using in-situ TEM we can now study, in real time, the phase transformation processes occurring in metals that directly relate to their mechanical or electronic properties. Additionally, it is possible to reveal with atomic resolution the dynamic surface rearrangement of catalysts in action under realistic reaction conditions. The ability to study processes in liquids has led to insights into structure development in the active layer of polymer solar cells, as well as in hydrogels for biomedical applications. Of even greater interest are the recent possibilities of liquid-phase EM, where material processes inside a liquid are being investigated using EM, for example for the real-time imaging of the lifetime-limiting shape-transformation processes inside operating lithium battery electrode surfaces. Other exciting applications include the study of crystallization processes in liquids or dispersions of nanoparticles that are at the basis of the production of pharmaceutics and electronic products. State-of-the-art EM technologies require an expensive, constantly evolving infrastructure as well as a critical mass of high-level EM experts. Both the Life Sciences and Material Sciences communities face similar needs and challenges for access. NEMI will therefore unite these fields and coordinate activities across sciences and institutes. 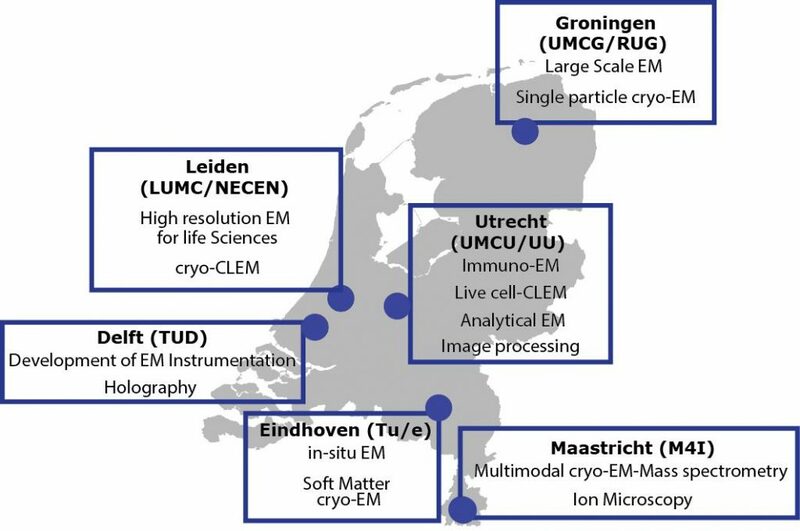 NEMI will consist of regionally distributed nodes, emphasizing local specialized expertise and resources and will include the large-scale scientific infrastructures NeCEN (Netherlands Center of Electron Nanoscopy) and M4I (Maastricht MultiModal Molecular Imaging). A national plan will be developed to coordinate the acquisition of the latest generation of EM equipment and to provide access to the regional centers. 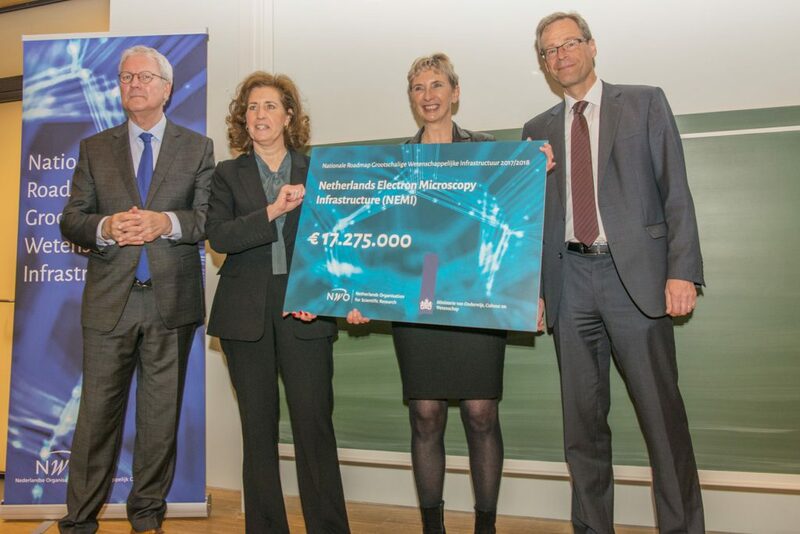 NEMI will cooperate closely with Dutch and international companies and collaborate strategically with the projects NL-BioImaging AM (light microscopy), Instruct (structural biology), NanoLabNL (nanotechnology), NSEO (geoscience), and Health RI (national coordinated infrastructure for personalized medicine and health). The Central Access Node in Utrecht is the national central entry point, providing information about the infrastructure and directing potential users to the desired imaging technology as served by the NEMI Nodes. The Regional Nodes provide access to mid-layer EM applications and step-up technology for Flagship Nodes. The Regional Nodes in Amsterdam, Delft, Eindhoven, Enschede, Groningen, Leiden, Maastricht, Nijmegen, Utrecht, Wageningen are of key importance to enable the vast number of locally initiated EM studies at mid-resolution level and to perform pilot studies for analysis on specialized EMs. The Flagship Nodes in Delft, Eindhoven, Groningen, Leiden, Maastricht, and Utrecht, concentrate highly advanced or specialized EM techniques to specific sites only. These Nodes focus on regional strengths and create optimal conditions for access from other regions. Each Flagship Node is connected to one or several excellent principal investigators (PIs), who are recognized leaders in their field, to drive innovation and application of specialized EM technology. In addition, a facility manager or support team is in place to create optimal conditions for access from other regions. Flagship Nodes can co-exist with Regional Nodes and cost-effectively share personnel and instrumentation.